When Mahatma Gandhi once said, “The best way to find yourself is to lose yourself in the service of others,” I feel he was promoting a life of human goodness. As 2016 comes to a close and we embark on the new year, there's no better time to take stock of what you are doing for others. As an equestrian I have had the fortunate ability to travel this country showing. This sport has allowed me to see this country in ways I never imagined. I have met fascinating people and have toured interesting places, but I have also had my eyes opened to see those struggling across our nation. As junior riders we are very busy. 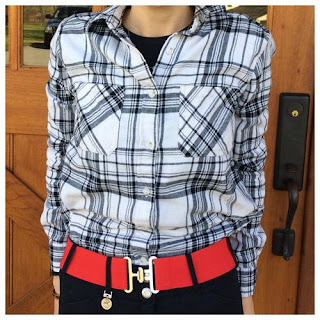 We're balancing riding and school and spend many days away from home. But that doesn't mean we can't help others. 1. 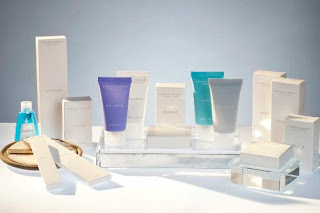 Collect toiletries for hotel stays. For years now I have collected toiletries from our hotel stays while on the road. I pack my own supplies and collect the small bottles and soap bars the hotel provides. I accumulate large bags over the year. Every February my school, Ancillae-Assumpta Academy, hosts a Martin Luther King Service Day. I share my toiletries and we put together individual bags for the homeless. It’s the things we take for granted that can mean a lot to some. Imagine how many toiletries you could collect if your trainer and barn friends did the same thing! 2. 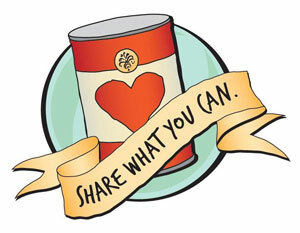 Organize an at-the-show food drive and team up with a local organization. Last winter I spent February and March in Gulfport, Mississippi for the Gulf Coast Winter Classic. Staying there for several weeks we befriended one of the security guards of the condo we rented. I learned how the people of Gulfport were still to this day struggling with the effects of Hurricane Katrina. She told me how she has friends who live in tent communities under highway bypasses because they could not afford to rebuild. Upon hearing this, my mom and I collected food for her to share with her friends. I look forward to organizing a bigger food drive when I return this year. I have also reached out to a private girls Catholic high school in the Gulfport area to learn of service programs I can help with while I am there. 3. Get involved with a horse charity. 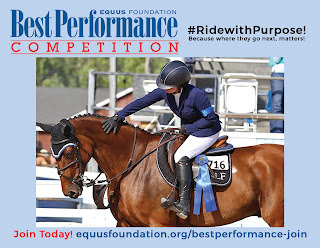 I am also very excited to have joined the EQUUS Foundation Best Performance Competition by a Junior 12-14. The Equus Foundation is dedicated to equine welfare. #RidewithPurpose! 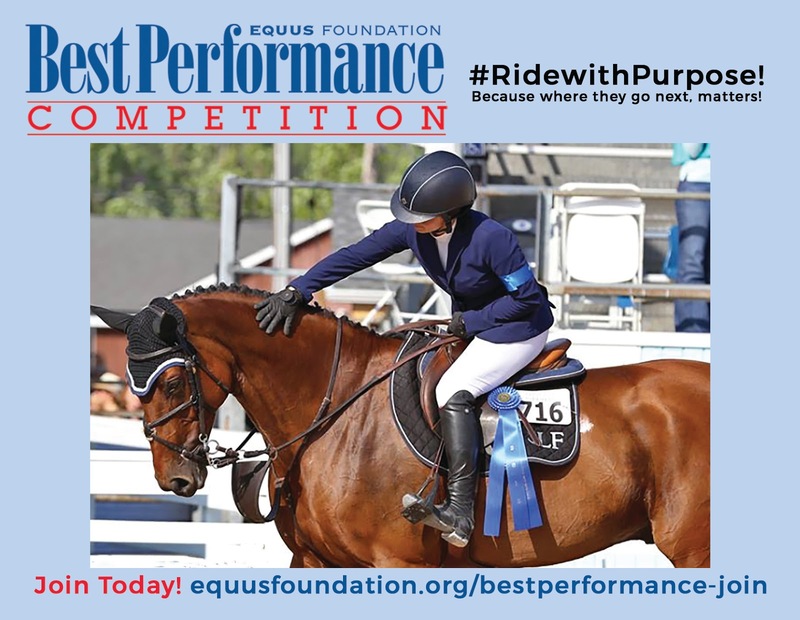 www.equusfoundation.org/bestperformance. It’s not too late to join. For a small fee you can join the program and begin to earn cumulative points at member shows throughout the year and potentially win Best Performance of the Year in your division. Winners may select an equine charity in the Equine Welfare Network to receive a grant in their name. And the membership dues go to finding new homes and second careers for unwanted horses. 4. Enlist equestrian companies to join in! My favorite charity to promote is Danny and Ron’s Rescue. This summer they made a trip to Baton Rouge after the floods to help area dog shelters and took much needed food and supplies to help the horses. While showing in Gulfport I met people who lived in Baton Rouge. Thankfully they were okay after the flooding, but the area was devastated. Danny and Ron’s Rescue pulled many dogs from the shelter in Baton Rouge. Many were positive for heartworm and were in need of costly heartworm treatment. Additionally Danny and Ron’s South Carolina facility had damage this year in a storm. Although this put financial pressure on the rescue, they still went out of their way to help the Baton Rouge dogs. The Danny & Ron belt. I invite my fellow junior equestrians to think of ways they can help serve their own communities or favorite charities. Think outside the box. Small efforts add up. One stride at a time! Maggie Junkin competes on the circuit with her horse, Tommy Bahama. She lives with her family, 5 dogs, and 3 cats in Jenkintown, Pa.